Wow. Another Godzilla reboot. Another director, different writers, a big named star. I mean, Bryan Cranston for God’s sake. Walter White. How could this possible be bad. This is going to be incredible. That’s what I thought before I started watching it. Despite everyone I knew that had seen it telling me how incredibly bad it was. The story’s nothing new. It’s the same Godzilla garbage they’ve been jamming down our throats since they were made overseas. Nothing imaginative there. I get why they want to remake a movie like this, I really do. With today’s technology and advances in computer imagery, how could you not want to make a giant dinosaur-like creature that destroys cities and fights with other giant things? It seems like a no brainer, right? I don’t need to go into the details here. It’s Godzilla versus Mothra and Mothra’s girlfriend. They battle across cities, across the Pacific ocean, and end up San Francisco. Why wouldn’t they end up in San Francisco? Every movie seems to end up there lately. The problem — aside from the problem that Walter White’s only in the movie for like a quarter of it (if that) — is that there’s not enough Godzilla. Is there a lot of people talking about Godzilla? Yes. Is there a lot of people looking at camera footage of helicopters and planes flying over Godzilla? Yep. Does Ken Watanabe say “Godzilla” with the most awesome accent? You know it. Is there enough actual Godzilla? No. Hell no. Not even close. 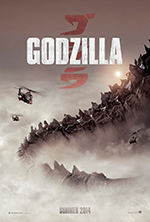 I didn’t count, but I’m pretty sure Godzilla’s only on the screen for a handful of minutes, at best. There’s a lot of “I see his back spikey fin things coming out of the water!”, but there’s very few scenes of him actually doing stuff. I’d have given this zero stars, save for one moment. There’s a really great scene towards the end where Godzilla spits blue fire into the mouth of one of his enemies and the CGI on it is incredible. Clearly that’s where a good chunk of their special effects budget went. To that one scene. The rest of it didn’t look any better than the Godzilla of 1998 to be honest. I hoped for more. I gave it my best shot. I went in with an open mind, despite the haters. I wanted to enjoy it and cheer and yell as Godzilla smashed the hell out of everyone and everything. I even hoped for a silly throwback to someone saying “oh no, it’s Godzilla” and having their mouth keep moving like it did in the old dubbed films. But alas, this was a snorefest. I can’t even recommend watching it just to see how bad it truly was. It’s so bad you should just skip it. You’ve wasted enough time on Godzilla just sitting there and reading this. If you did see Godzilla and you liked it, we can’t be friends anymore.